In the mood for chicken piccata, but a little short on chicken for my guests. I turned a tradition Italian meal into a pasta dish. It’s a restaurant trick I took to heart, learning most nice meals can be extended by pasta in a pinch. This one works especially well with all the lemon, wine and chicken broth. If truth be told, I think it might be my new favorite pasta recipe. This is one of those medium level recipes. If you’re a novice cook, all the instructions are here to guide you. Total time including chicken prep should be around 35 minutes. 1. With a sharp chefs knife, carefully cut the chicken breast horizontally through the center of the breast to make a total of 4 thin pieces. Place 1 piece of chicken at a time into a gallon size plastic bag and pound chicken with a flat bottom meat pounder until about 1/3” thick. 2. Dredge the chicken in flour and season with salt and pepper. Set aside. 3. Meanwhile, bring a pot of heavily salted water to a boil for fettuccine. Cook fettuccine according to package directions. Place the pasta in a large serving bowl. 4. In a large skillet, melt the butter with olive oil over medium high heat. Add the chicken and cook for 3 to 4 minutes per side, or until cooked through. Do this in batches if you need. Turn down the heat if oil starts to splatter. Move chicken to a cutting board and set aside. 5. Deglaze the skillet with wine. Add chicken broth, lemon juice, capers, parsley, salt, and pepper. Simmer for several minutes until the sauce reduces by about a third to half. 6. Slice chicken into bite sized strips and add them to the sauce. Cook for 5 minutes, then pour sauce mixture over fettuccine. Top with cheese and toss to combine. This sounds really tasty! I'm a vegetarian, but I feel like I could make this veggie-friendly very easily and it would be delicous. You can Morgan and it's a good idea. Sauté a cut up veggie like zucchini (remove it from the skillet once it’s done cooking), skip the chicken and use veggie broth or water to make the sauce. I agree with Morgan! I love the sound of this dish, veg for myself and with chicken for my partner. Beautiful! I am generally under the impression that everything in life is made better with pasta. So I totally agree with you. This dish looks fantastic! I agree with Joanne. Everything is better with pasta. My problem with this recipe is I wouldn't be able to stop at one serving! 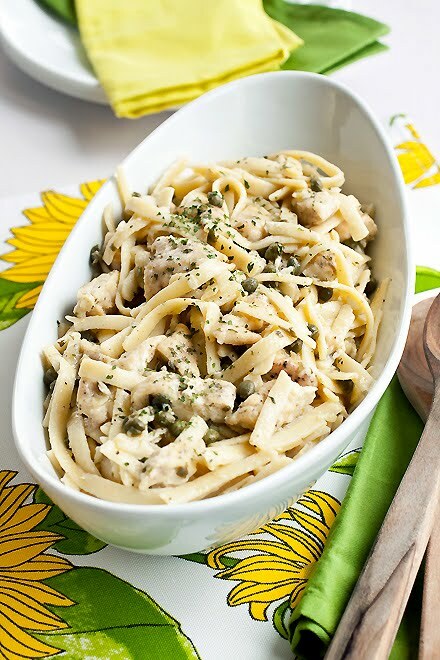 We love chicken piccata - I was planning on making it next week. I will try your version instead of our regular one. My husband loves fettuccine, so this should be a hit! un piatto unico eccezionale!!!!!! !mi piace!!!ciao! Whatever the original is supposed to look like I think I prefer yours.. :) I haven't tasted chicken piccata before so have nothing to compare it with but I am certainly voting for this one. Looks delicious! The pasta looks so good. My dad would love this recipe. looks great, and not a long list of ingredients. I might just need to give it a try. Love that table cloth. People! You NEED to make this pasta!! This is my newest favorite pasta. If you like lemon and/or capers, you should give this a try. I really like capers so I like to add the whole 4 oz. jar! Also, this recipe is super easy to make non-dairy...just use Vegan "buttery spread" in place of butter and add the grated Parmesan at the end only to the individual plates of those who are dairy tolerant. It is pretty yummy, even without the Parmesan. Laura, congratulations on another winning recipe. When are you going to invite me over for Chicken Piccata Pasta again?